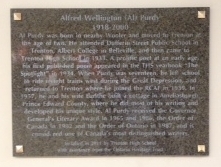 Al Purdy was born in nearby Wooler and moved to Trenton at the age of two. He attended Dufferin Street Public School in Trenton, Albert College in Belleville, and then came to Trenton High School in 1933. A prolific poet at an early age, his first published poem appeared in the THS yearbook “The Spotlight” in 1934. When Purdy was seventeen, he left school to ride freight trains west during the Great Depression and returned to Trenton where he joined the RCAF in 1939. 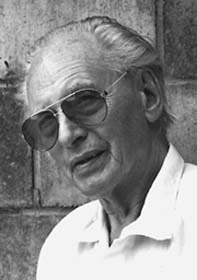 In 1957, he and his wife Eurithe built a cottage in Ameliasburgh, Prince Edward County, where he did most of his writing and developed his unique style. Al Purdy received the Governor General’s Literary Award in 1965 and 1986, the Order of Canada in 1982 the Order of Ontario in 1987, and is considered one of Canada’s most distinguished writers. Sponsored by the Hastings – Prince Edward Learning Foundation and the Scott Griffin Foundation, a permanent display outside the room includes a sculpture of Purdy, “Al Purdy Reads”, crafted by THS Arts Teacher Anne McDonald and a brick from Purdy’s boyhood home in Trenton. 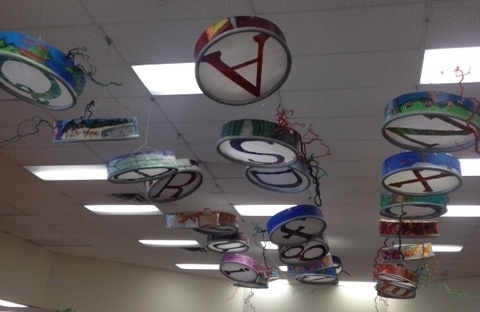 Inside the Library, a Student/Staff sculpture was installed. Hanging from the ceiling, it is the reflection of a typewriter keyboard. Some of the paintings on the keys are artistic responses to Purdy’s poems. Seven keys are positioned so that they are closer to the ceiling than the rest. These seven spell ‘Al Purdy’. Most significantly, the Library houses a collection of Purdy’s works which his wife, Eurithe, believes in second in the world only to her own. Materials were purchased or donated from various sources and are used by students who study Purdy in their senior English classes.